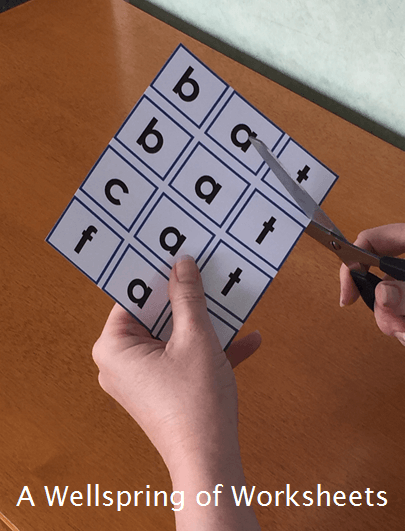 What Are CVC Word Clip Cards? 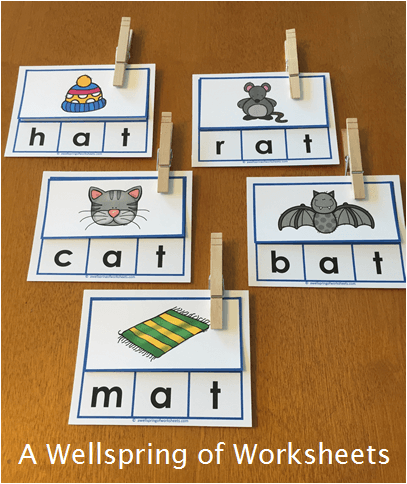 CVC word clip cards are just one of the many fun resources you can use to teach your kids the the all important concept of cvc words. For the clip cards, clothespins are used as the "clips". Clothespins are an inexpensive tool to give your kids a "hands on" way to give an answer or show a match. I found a set of 50 simple wooden clothespins at Target for $1.79. 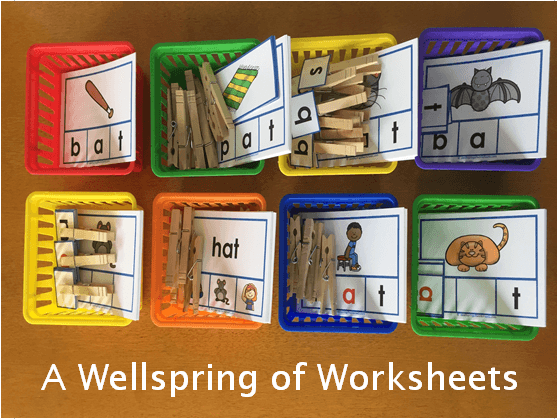 There are lots of ways to use clothespins as clips in our 28 sets of clip cards. Keep reading and you'll see what comes in each set, find suggestions for how you can use them, and discover some nifty tips on how to store them. What Comes with Each CVC Word Clip Card Family? 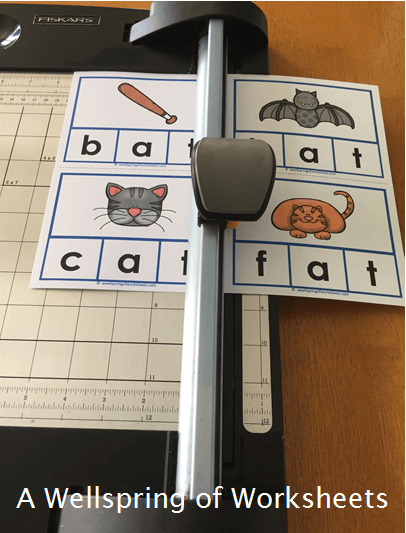 Each cvc word clip card family includes 8 sets of cards, one set of pictures, and three sets of letters as pictured above using the -at word family as an example. There are three types of pages in each word family as shown above - the clip cards, the letters, and the picture cards. The Clip Cards Are Color-Coded! 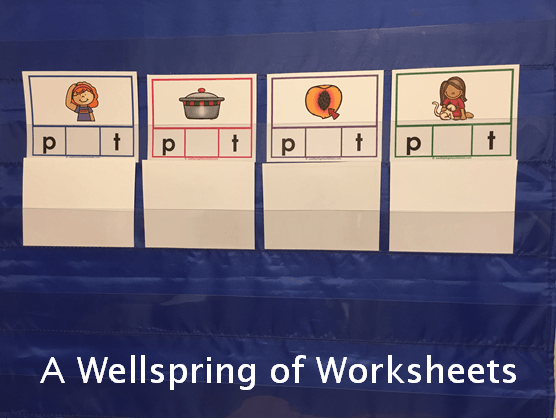 The clip cards are color coded by short vowel - all the short a words are in blue, the short e words are in green, the short i words are in purple, the short o words are in pink, and the short u words are in orange. 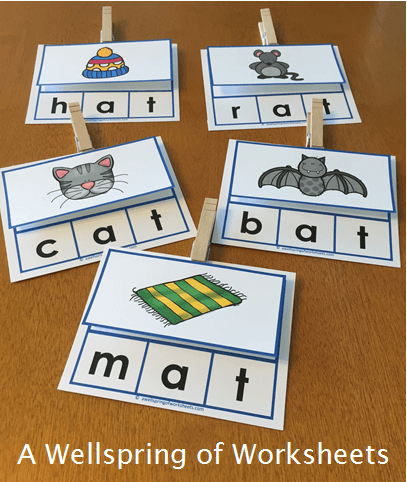 There are Lots of Ways to Use These CVC Word Clip Cards! I've come up with quite a few ways to use all these clip cards and I'm sure after you print them out you'll find lots more ways to use them, too! I had some ideas planned out, then as I played with the cards I came up with even more fun ways to use them. Use them in a pocket chart. They fit perfectly! You can use them whole group. 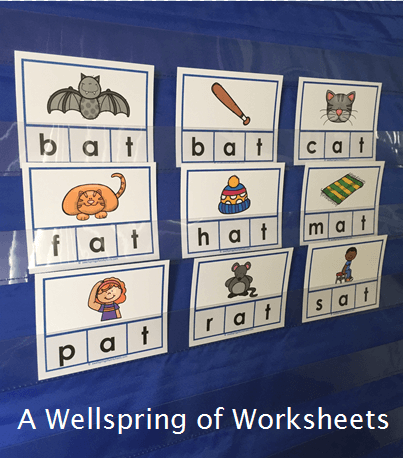 You'll come up with plenty of ideas to stress the consonant vowel consonant pattern. You can use them in small groups. 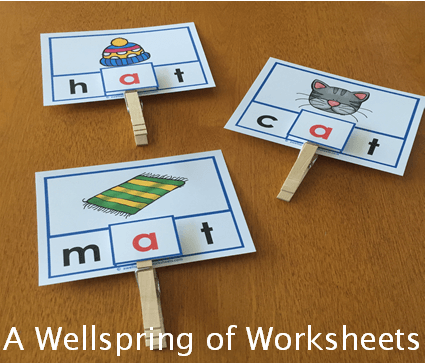 A great way to help kids understand the concept of the short vowel sound. Print and use only one or two sets from each word family or use all of them. You can use only one word family at a time or you can mix and match the short vowel word families. Many more ways! You're imagination is the limit. Here are some suggestions for how to use them set by set using the -ab word family for all these examples. Click on any picture and you will be taken to the page on our site with all of our cvc word clip cards. The first set of cards in each word family has a graphic for each word and the cvc word spelled out underneath it, each letter in a separate box. When using these cards in small groups, try putting the cards in a pocket chart like in the picture. Read the cards to your kids then have them read them to you. Sound out each letter and then say the word. Of course, initially they may not be reading the words at all. They may just rely on the picture cue to guide them. 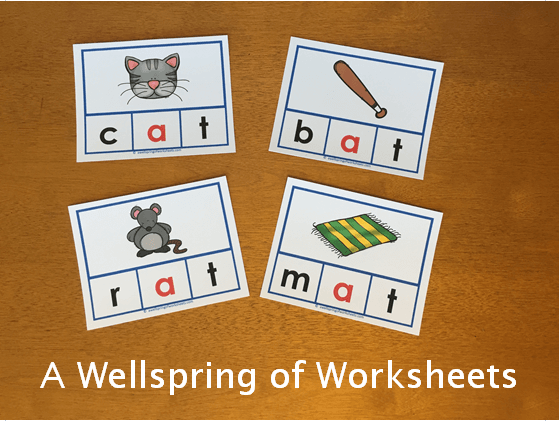 Be sure to stress to your kids that these words have a consonant vowel consonant (cvc) pattern and that the middle letter makes a short vowel sound. You may want to have one set of the cards for each of your students. Arrange the sets in the same order so as you move from one card to the next everyone will be on the same card. 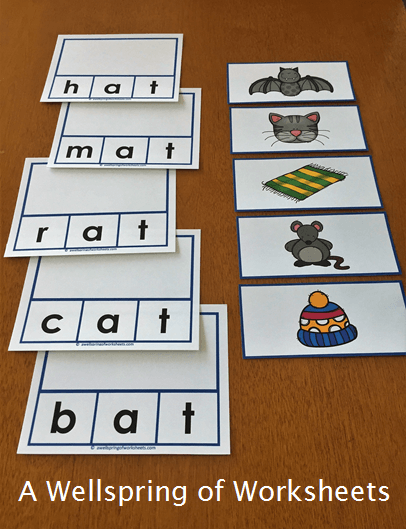 First, sound out each letter separately, segmenting the words into individual sounds. Have your kids track each sound by putting their fingers on the corresponding letter as they sound out the word. Then blend the sounds together slowly, all the while tracking with fingers. Lastly, have the kids say the words all at once, quickly moving their finger from the first letter to the last letter. 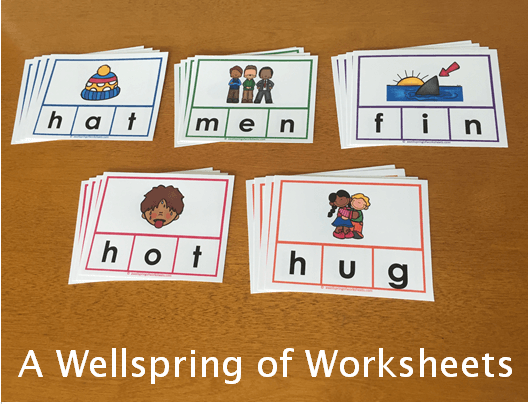 Over time, as kids get to know the words, you can just give them these cards to have them practice reading the words. They can read them out loud, to themselves or to a friend. When using these cards whole group, you can put the cards in a pocket chart and use a pointer. You can call one of the kids up to use a pointer as you and your students sound out and say the words. The second set of cards has the pictures and the words, only the words have the vowel in red. Here you can stress the sounds that the vowels make. 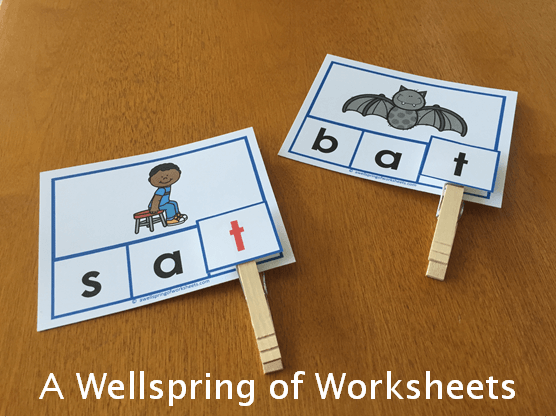 Have the kids say the words and repeat the short vowel sound. Remember to have them put their fingers on the vowels as they say the vowel sound. The third set of cards is different from all the others. Instead of a graphic in the big box at the top of the card, a cvc word is in that place. In the boxes where the letters were on the other cards, there are three pictures, one of the object that goes with the word and two others from the same word family. Kids are to clip the picture that goes with the word. Be sure to have your kids read the word out loud, say what each of the pictures are, and then clip the correct picture. 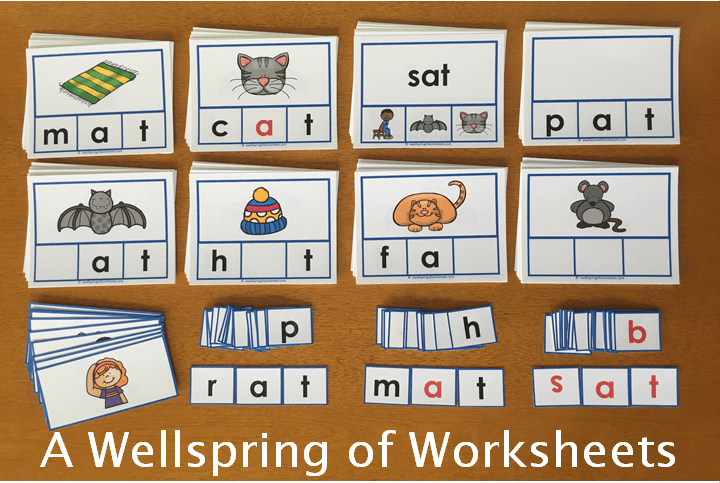 The fourth set of cvc words clip cards has the letters spelling the word, but no picture. Have the kids match the picture to the word. 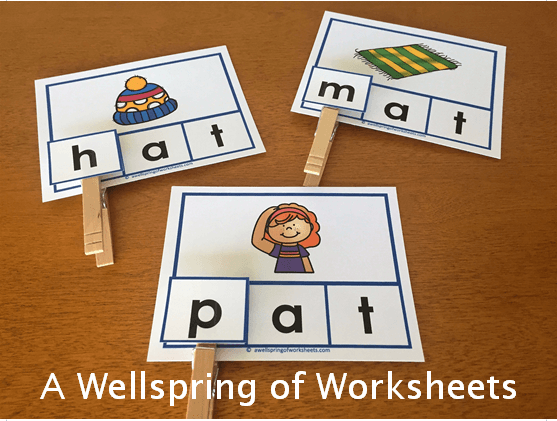 This activity touches on comprehension. 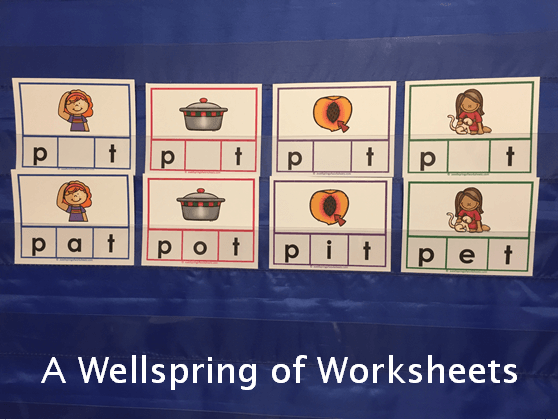 It sees how well your students understand the meaning of the words they are learning. There are several ways you can have the kids match the picture to the word. First, you can have them just set the picture on the empty space. Second, You can just have them clip the picture onto the card without having it glued onto the clothespin. Lastly, you can have the pictures glued onto a clothespin and have them clip it on. See the examples above. 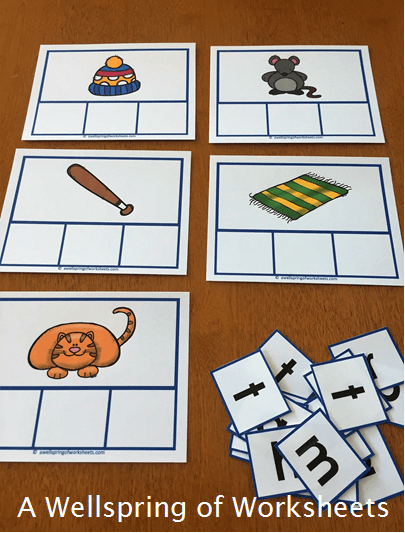 The emphasis for the fifth set of cards is on identifying beginning sounds. These cards have the picture with the middle letter and the ending letter. Use the letters to fill in the missing letter. You can have the letters glued onto a clothespin and clip them on, or you can just have the kids set the letters on the cards. Make sure the kids sound out the beginning letter sound to be sure the word they make goes with the picture on the card. Of course, they should sound out and say the entire word, too. The sixth set of cvc clip cards has the picture with the first letter and the last letter of the word. The emphasis here is on the middle sound, which will always be a short vowel sound. You can use all black vowel letters from the set or only the red vowels. 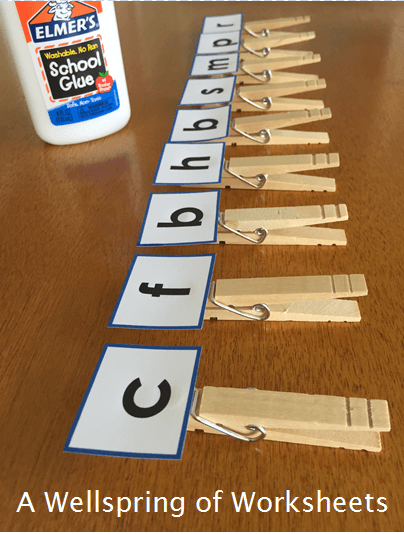 Again, you can just have the kids set the letters right on the cards, use clothespins with letters glued onto them, or even clothespins with letters just written on them. The seventh set of cards has the picture and the first and middle letter. The emphasis here is on the ending sounds. 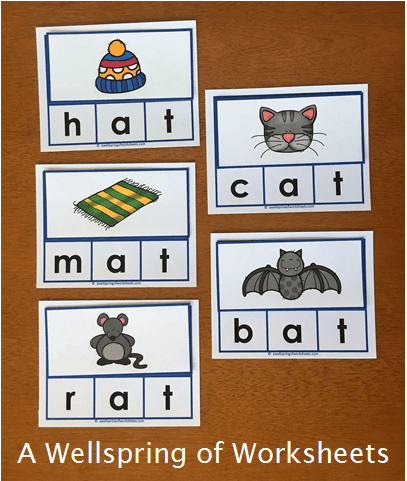 Again, the kids can sound out the words and add the missing final letter either by setting a letter on the cards or by clipping a letter on. The last set has the pictures on the cards, but no letters. Here you have some options. You can print the cards, cut them apart and laminate them. This way the kids can use a dry erase marker to write the words on the cards directly. 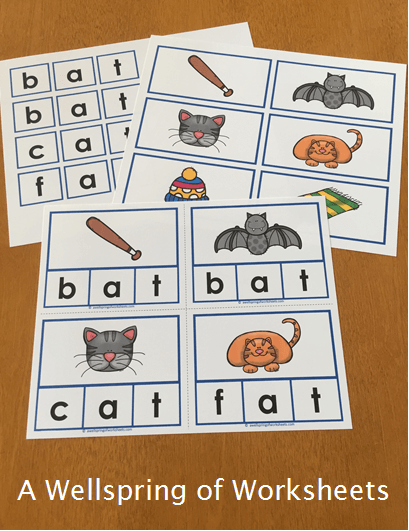 Another way is to have the kids simply place the letters on top of the cards in the correct boxes under the graphic. Lastly, you can glue the letters onto clothespins and have the kids clip them onto the cards. No matter how you go about it, the important thing is that the kids put the words together and read the words out loud. Have them sound out each letter individually - the first consonant, the short vowel sound, and the ending consonant. Then make sure they put the word together by saying the word all at once. 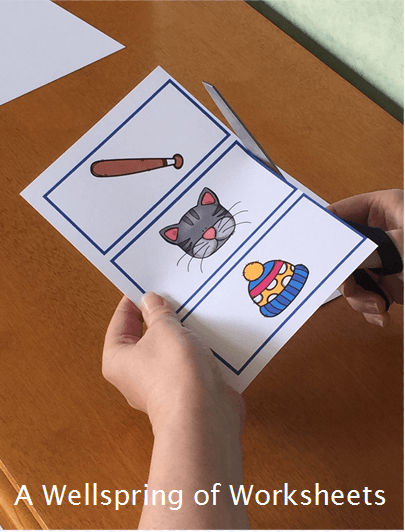 Once your kids understand how to use the clips, the letters, and the pictures, you can have the kids use them in small groups without any supervision. Simply set them up separating each set of a word family in small baskets, put hem on the table and let kids choose which set they want to use. When they're done with that set they can choose another one. They can work on the cards in each basket until their small group time is up. Kids should take the time to sound out each letter sound and say each word. You can have them say the words to a friend, too if you like, for more practice. 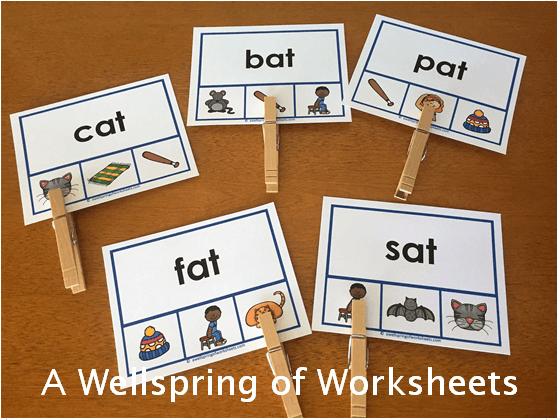 Try using the clip cards whole group (or in small groups) to show kids how changing one letter can change the consonant vowel consonant word to another consonant vowel consonant word. In this example I've put up four words that all have the same beginning letter (beginning sound) and ending letter (ending sound). Underneath these cards I've put the answers, but turned backwards so the kids can't see them. Kids look at the pictures and tell me what vowel (and the vowel sound) that would go in the empty spot to make the word. I then turn over the backwards card and show the answer. 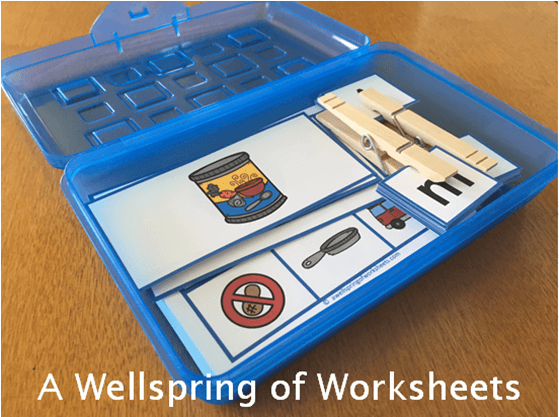 You will need to become a member of A Wellspring of Worksheets website before you can print the clip cards. It's really a great deal. It's much less expensive for an annual membership than to find and purchase these materials on TeachersPayTeachers. Check out the membership page here. I've created these cards so that they are about 1/4" from each of the edges. Be sure and take a good look at the preview page to make sure the cards have that thin border around the edge. One time I printed them and the "Fit to Page" box was automatically checked. The cards ended up printing with a larger margin around the edge of the page and I had to trim the whole set down because the margin was too large along the outside of the page. The best way to print the clip cards is to print them on card stock. They will last much longer. You may want to laminate them so they last even longer. For the quickest cutting, use a paper cutter for the clip cards. Cut on the dashed cutting lines. I'm a little particular and I don't like for any of the dashed lines to show on my cards. I cut slightly on each side of the dashed cutting lines so they don't show. I cut the letters and the picture cards out using scissors. The color lines are the outlines of these cards and they are fairly thin. I'd rather use scissors and get a more careful cut than use a paper cutter and accidentally cut the color border off even one cards and have to print the whole page again. Gluing the letters on the clip cards is really easy. If you decide to laminate the letters, you would of course need to do that before gluing them on the clothespins. Lay the clothespins out so that the lay flat like in the picture. Take some white glue and put it on the top on the end of the clothespin that clips on to things. Put the letters on the glue so the bottom of the letter is just above the metal piece on the clothespin. Move the letter around until it's straight. Leave to dry for at least 20 minutes. You may just want to glue two sets of the letters on the clothespins, the black set and the red set, since the red and black set is repeated in the other two sets. After you glue the letters on clothespins, you can store the clip cards in a large pencil box. The pencil box below measures 11-1/2" L x 7-5/8" W x 2-7/8" H. I found it at Target for about $2. Simply put the cards inside and then surround them with the clothespins. If you're like me, you'll want to label the box to tell which word family you have inside. Just a note: This large pencil box works great for larger sets like this -ab word family, but a smaller pencil box may work just fine for the smaller sets like the -eg word family and the -im word family. 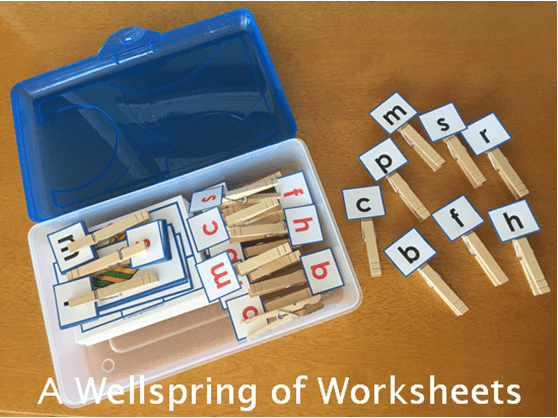 If you like the clip cards, but you don't want to go through gluing the letters on clothespins, and you only want to use a few different word families, you can store the clip cards in a small pencil box. The pencil box below is a standard size pencil box. The label says the measurements are 8-3/8" L x 5-5/8" W x 2-1/8" H. It cost just over $1 at Target. You can clip the letters using a clothes pin (one for each set of letters) as pictured or you can just put them in an envelope. As you can see, they are as snug as a bug in a rug! I hope you find as many creative ways to use these CVC Word Clip Cards as I did! Posted in Kindergarten, CVC Words.